Is Jiffy Reefing the simplest way to reef your boat's mainsail? 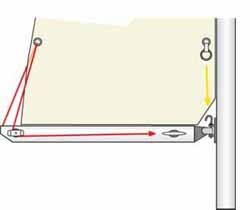 Is Jiffy Reefing the Simplest Method of Reefing the Mainsail? I unashamedly admit that jiffy reefing, or slab reefing as it's also known, is my choice of mainsail reefing system. Simple, efficient and reliable - the essence of a seaworthy system. With all control lines at the mast one person can pull a reef in on his own. This isn't just useful for singlehanders; it means that one half of a cruising couple can pull in - or let out - a reef in the main without disturbing the off-watch crew from his/her slumbers. A common, but in my view daft, alternative arrangement is where the reefing lines are led back to the cockpit, but the halyard and the reef cringles have to be dealt with at the mast - the worst of both worlds. Alternatively all lines can be lead aft, and all reefing done from the security of the cockpit. The price of this is that there's more friction in the system and a lot more lines in the cockpit. All control lines at the mast - the simplest and most efficient approach to jiffy reefing. 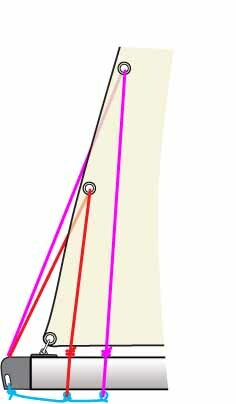 Get back on course and trim sails. Job done! Replace standard cowhorns with captive hooks, so the flying cringle can't fall off. 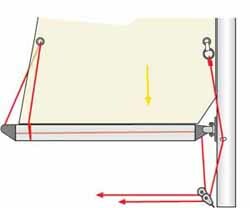 With this arrangement the mainsail halyard and the topping lift will be brought back to the cockpit through turning blocks at the foot of the mast, and the task of hooking the sail cringles over the reefing hooks on the gooseneck is eliminated. Two separate reefing lines are used for each reef; one pulls down the leech of the sail and the other pulls down the luff. So if you've got three sets of reef points in your mainsail, that's six extra lines in the cockpit. Hmmm. 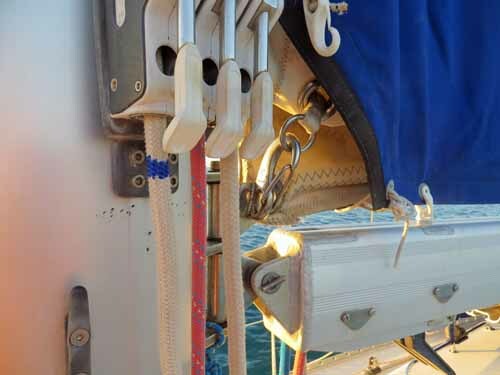 Tying back the reefing lines below the boom ensures that the foot of the mainsail is kept taut when a reef is pulled in. With the end of the leech reefing line tied in a locking loop around the boom, there's a tendency - particularly with a loose-footed mainsail - for this loop to migrate towards the mast. This allows a reef to be pulled down without applying any tension to the foot of the sail, resulting in a baggy reefed sail. Such a sail shape will produce more heeling moment than drive, which is not good. The solution? Tie the loops back to the end of the boom with a length of cord to hold them in position. Jiffy Reefing and Lazyjacks are made for each other. It's fairly easy to make a set up yourself, but it's even simpler with a complete kit like the Nautos Lazy Jack System shown here. Their kits come in three sizes; for small (up to 31'), medium(32' - 38') and large (39' - 46') boats.